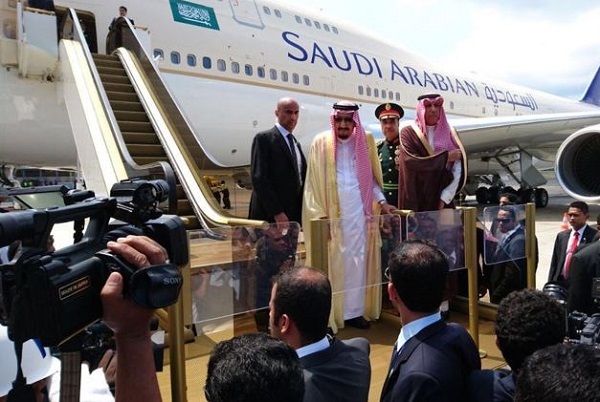 As mere mortals contemplate ever more restrictive baggage rules imposed by our friendly neighbourhood airlines, spare a thought for King Salman bin Abdulaziz al-Saud of Saudi Arabia, who arrived in Japan last week for an official visit. Not only were the Japanese left in awe at the size of his delegation and his 500 tons (metric) of luggage, but the king made his entrance by descending from his aircraft on one of two golden escalators. A fleet of 500 limousines were allocated to the royal party. The king’s ensemble arrived in Japan on ten aircraft with Japanese media reporting that the entourage was so large even Japanese government officials didn’t know exactly how many people to expect. If you were in town and trying to find somewhere to stay, you probably know already that 1,200 rooms in Tokyo’s best hotels were booked for the accompanying officials.